Fundraising Target: £4,000 – Achieved. People have been so generous in their support and donations that we recently got over the £4,000 mark. So what next? Increase the target of course! I’m now going to see if we can make it up to £4,500 – that would be brilliant. There is so much work to be done and opportunity to make a difference to those affected by PSC that PSC Support will make great use of every single penny and cent donated. Weight Target 14 Stone –More to do. I’m hovering around the 14stone 5lb mark at present. I’m doubling up my gym sessions with Kristy my personal trainer for the remaining weeks before the tip. To be honest I’m more concerned about getting my fitness as good as possible and the weight loss is really a consequence of that rather than the main goal. Age Target 42: On track. I’ll be 42 the day after we come off Kilimanjaro if all goes well! Last Sunday Jeff and I took on a Whernside and Ingleborough double whilst Paul and Debbie sunned themselves in Dubai (Envious? Me?). I think they had the better deal weather wise. We parked up just outside the Ribbleshead viaduct and set off around 9.30 in over cast and breezy conditions. Initially heading north westerly following the train line before turning to begin the climb up to Whernside’s ridge. 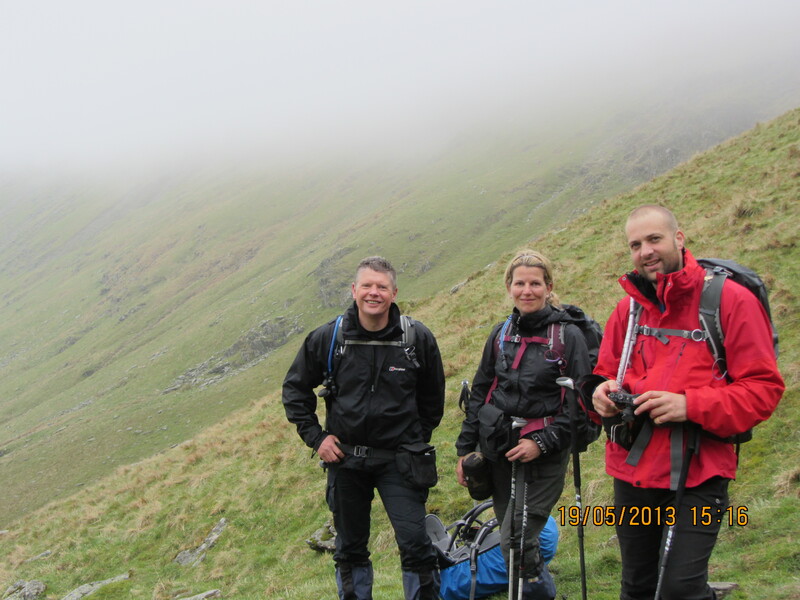 By this point we were in the mist and drizzle so out come the waterproofs. At this point I realise my Gortex over-trousers are at home – big time fail! Around 11.30am we make a quick stop at the summit wind shelter where I grab a cup of tea and an energy bar and then we’re off along the ridge and then down the valley where we stop to adjust kit and snaffle down a sandwich. It’s now windy and really raining – cold on the face as I try to reduce the presented surface area by receding well into my coat’s hood. We cross just north of Chaple-le-Dale and begin our way up towards Inglebrough. Once over the fells and past some pretty impressive looking pot holes we climb back into the mist and up a very steep and wet path of rock steps up to the north easterly side of set of Inglebourgh upper slopes. From there it’s a short climb to the south east to reach the summit trig point and the welcome respite of the wind shelter where we finish the last of our hot drinks. By this point my lower half is saturated and I’m cold so I’m glad to get moving again. The next hour or so we move north easterly along the upper slopes of Inglebourgh, across Southern Scales Fell and Park fell before descending down to pick up the road back to Ribblehead. In an effort to conserve battery life I rather smartly stuck my phone into aeroplane mode forgetting that this also disables the GPS. This means that I didn’t record any climb stats for this hike but Jeff estimated our route to be around the 14miles mark. We finished the route at around 4.30pm which is fairly respectable time. 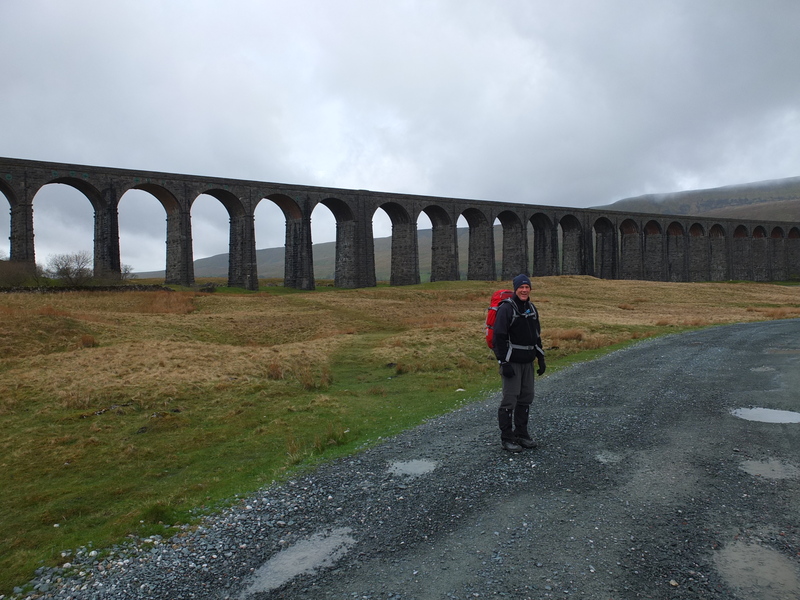 If we kept that kind of pace up we should be able to nail the Yorkshire 3 peaks under the 12 hour mark – a challenge I’d like to attempt but perhaps save for after the Kili trip as I don’t seem to be getting any takers from the rest of the team just yet. Not too many more weekends on the hills as we leave for Tanzania in 30 days’ time! 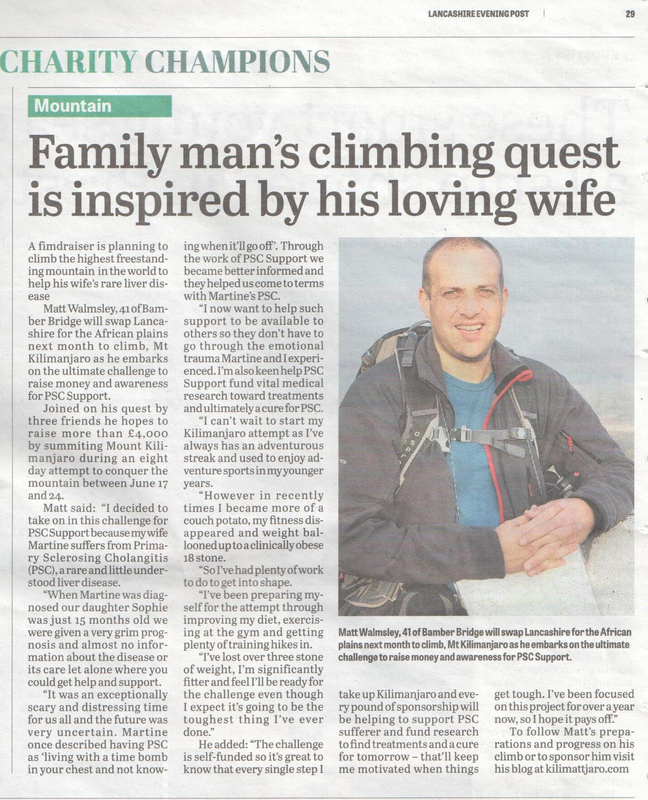 The Lancashire Evening Post, my regional newspaper picked up my press release and ran an article (PDF) on my climb today. With a estimated readership of over 92,000 it’s great to get some broader awareness about PSC, next month’s Kilimanjaro challenge and perhaps encourage some donations to PSC Support. Categories: Kilimanjaro, PSC | Permalink. Placebo Powered Kilimanjaro Medicine Bag? Altivit – a multivitamin and herb supplement designed to aid acclimatisation. Glucosamine – to aid cartilage production. I sometimes get knee pain so I figure I might as well try to give them a little help. Garlic – to aid circulation/ coronary wellness and cholesterol issues. I’ve no history of heart problems but figure that cardio vascular performance is going to be important up Kili. There’s also some tales that in Tibet that the local garlic soup helps acclimatisation. Diamox (Acetazolamide) as a respiratory stimulant to help acclimatisation. Ciprofloxacin – antibiotic useful in the treatment of diarrhoea. Avomine (Promethazine) – an Antiemetic in case I get nauseous due to altitude or even stomach upset. Imodium (loperamide hydrochlorid) – Treats diarrhoea by slowing down muscle movements in the gut so more water can be absorbed. Malarone (Atovaquone Proguanil) – Anti Malarial tablets. Ibuprofen – regular over the counter pain killers. The UK’s National Health Service is designed to be “free at the point of use” but for a number of my medications I was expected to pay for a private prescription and pay for the drugs. I ended up sourcing the prescription only drugs online through~UK online pharmacy services www.drfox.co.uk and pharmacydirectGB. This was the first time I’d bought UK medicines online but I found it a slick experience, low cost and all the drugs came from regular UK dispensaries. Categories: Gear, Kilimanjaro, Thoughts | Permalink. During an evening training hike on Pendle Hill Jeff’s good idea was to ignore the paths for the second ascent and just go directly up the hill. It was ***** steep and had my calves were complaining as I hauled myself up. It’s pretty clear to spot on the climb stats! Not long to go so we’re getting as many hikes in as possible. I may not blog on each and every one of the weekday short hikes but you should see the climb stats get tweeted if you follow @kilimattjaro. In the largest ever study of PSC a global team of investigators have studied the genes that contribute to why someone develops PSC. This work is of huge importance to all interested in developing new therapies for patients with PSC, and has understandably generated a lot of excitement for patients and clinicians. First and foremost it reflects an enormous effort on the part of patients and investigators to collect DNA samples from so many people with PSC across the world. This in its own right demonstrates how it is possible to make progress in understanding a rare disease, by multiple groups working together. It is hoped this will continue in the future, with patient organisations such as PSC Support. Secondly the genetic findings are striking, for identifying new immune genes that are associated with the risk of developing PSC. Collectively with prior genetic studies, this latest work contributes enormously to the slow but steady effort to piece together the puzzle of why a patient gets PSC/colitis. If medical researchers can better understand this, then it is hoped they can better design new therapies to treat the disease more directly. Efforts will continue to discover more genes associated with PSC, but more importantly to model experimentally how they actually contribute to PSC itself. If you’re interested, the genetics paper can be accessed at Nature Genetics. A brand new state of the art review will also very soon appear in the medical journal The Lancet on PSC, which brings together all the latest advances in disease understanding. We’re still some distance from proven PSC therapies or a cure but it finally feels like there is real momentum and increasing understanding of the mechanisms of this horrible disease.